So, I don't want to be a personal horn-tooter or anything, but today's my birthday. My Auntie RoRo (ok, her name is Rosemary, Rosie for short. Or RoRo. Depends on who you are.) dug up a couple of old pictures from my days in Vermont when our families were neighbors on Loveland Hill. Just so you know - neighbors in Vermont is not nearly as close as it is here in the Midwest. Well, in suburban land where I live, anyway. We had some space. It was a quick 5 minute walk, but 5 minutes on foot none-the-less. Uncle Randy and Auntie RoRo had wild strawberries that grew in the field next to their house. My cousins and I loved spending summers just sitting in the field and chowing down. That, and we'd go 'hunting' for newts. I loved those little orange suckers. So hard to catch one, but such a treat when you did! Here I am celebrating my 4th birthday. Don't you just love my haircut??? You can see my teddy in the foreground. I loved that bear so much. I still have him. He's in a storage container along with the Carly blanket my Auntie Lynn made for me. I loved that blanket, too. I wore them both out. They still smell the way they should. That smell is still one of the most comforting sensations I have ever known. I wasn't a thumb sucker. I was a finger sucker. Yep, that's right. The first two fingers on my left hand. I'd stick them in upside down, and grab my teddy across his belly with my right hand. I'd bring him up to my ear, and use his ear to rub my own ever so slightly. No surprise, teddy's ear wore down to the nub. And The Stallion wonders why I like it so much when he rubs my ears. Here's Auntie RoRo. Obviously, she is attending one of my infamous tea parties. You can't host a tea party without an apron and pearls! ...and duck slippers? 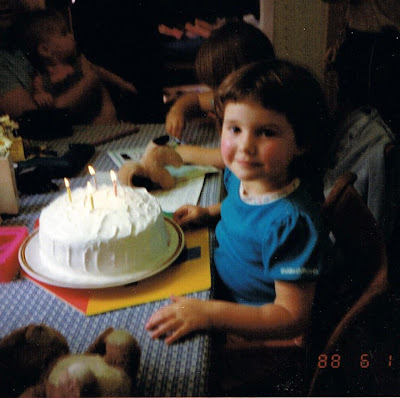 I loved that Little Tikes table. Later, after it moved with us to Missouri, the table's legs would be used for sword fights with my yet-to-be-born little brother Matthew. Incidentally, Matthew's birthday is next week. He'll be celebrating #19 on the Appalachian Trail with my father. I received his birthday wishlist via email last week, which included, among other things, an old BMW motorcycle. I talked to him today and he said I could go ahead and ship it to Grammy Jan's house in VT and he'd just return home on the road after completing the trail. I'll stop before I embarass him too much. I'm so proud of what he and my father are accomplishing right now, and I can't wait for him to come home and shower and shave off all of his hair! Then I'll give him a hug.